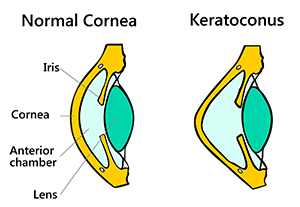 Keratoconus (KC) is a progressive eye disease which causes the cornea to thin and become conical over the time. KC is the most common corneal dystrophy in the US, affecting one in every 2000 Americans, and is the cause of about 16% of corneal transplants. Join us to raise awareness and receive the latest news and information about Keratoconus. You can also share your images on our Flickr group and help other people to learn more about keratoconus.